These are going to be my only ingredients for dinner. 10 oz rib-eye steak, salted and peppered. I’ve salted the meat so that as it warms to room temperature, some of the moisture will be drawn out. Steaks that are too wet lose too much flavor country as it cooks. 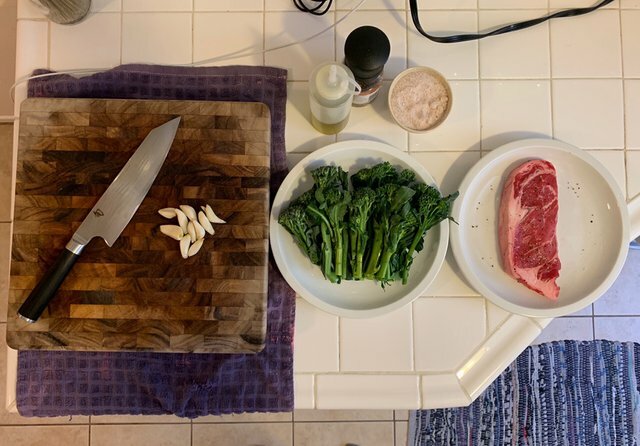 On the side is a bunch of baby broccoli in olive oil and garlic. Simple is often better and this is one of my personal favorites. The only thing that would make it better is some rye whiskey. @distantsignal You have received a 100% upvote from @intro.bot because this post did not use any bidbots and you have not used bidbots in the last 30 days!